Abu Dhabi: The first Arab Space Coordination Group initiated by the UAE along with 11 Arab nations will develop an advanced satellite to monitor earth, environment and climate, it was announced on the opening day of the Global Space Congress in Abu Dhabi on Tuesday. “Today, we have witnessed the launch of the Global Space Congress 2019 in Abu Dhabi and the signing of a charter to establish the first Arab Space Coordination Group, involving 11 Arab countries. The group’s first project will be the development of a satellite by Arab experts. I personally believe in Arab talents,” said His Highness Shaikh Mohammad Bin Rashid Al Maktoum, Vice-President and Prime Minister of the UAE and Ruler of Dubai, following the official announcements of these two major initiatives in Abu Dhabi on Tuesday. Shaikh Mohammad attended the signing of a charter to establish the first Arab Space Coordination Group at the official opening ceremony of the Congress, a three-day conference organised by the UAE Space Agency at St Regis Hotel in Abu Dhabi. The satellite will be developed at the UAE’s highly advanced facilities made especially for this purpose, benefiting from its experiences gained by its previous missions in manufacturing a wide range of satellites. “We have named the satellite “813”, after the date that marked the beginning of prosperity for the House of Wisdom in Baghdad under the reign of Al Ma’mun, the house that once embraced scientists, translated notable texts and produced scientific capabilities,” said Shaikh Mohammad. He stressed that the country is leading Arab efforts in the space sector. 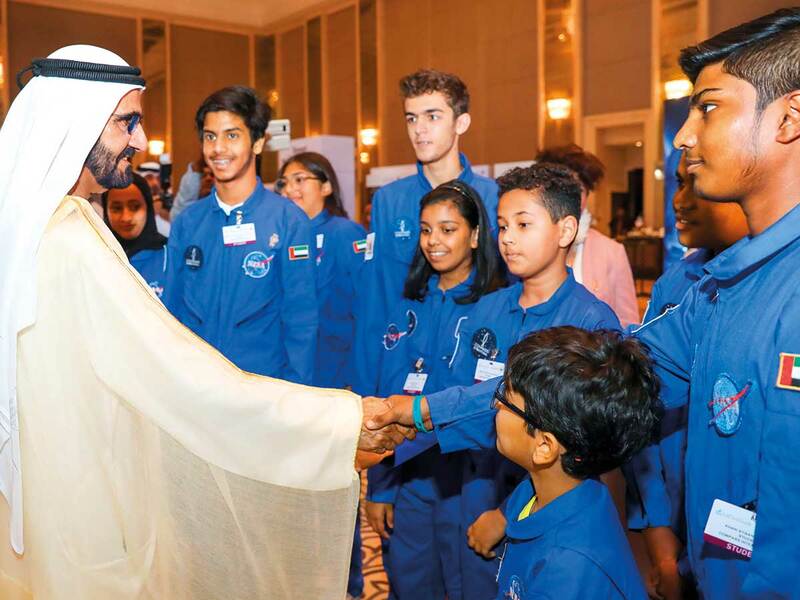 “We have a great faith in Arab talents and scientists,” said Shaikh Mohammad, adding that the Arab nations boast of scientists, scientific expertise and exceptional potential, which are enough to lead the space sector towards excellence and leadership. 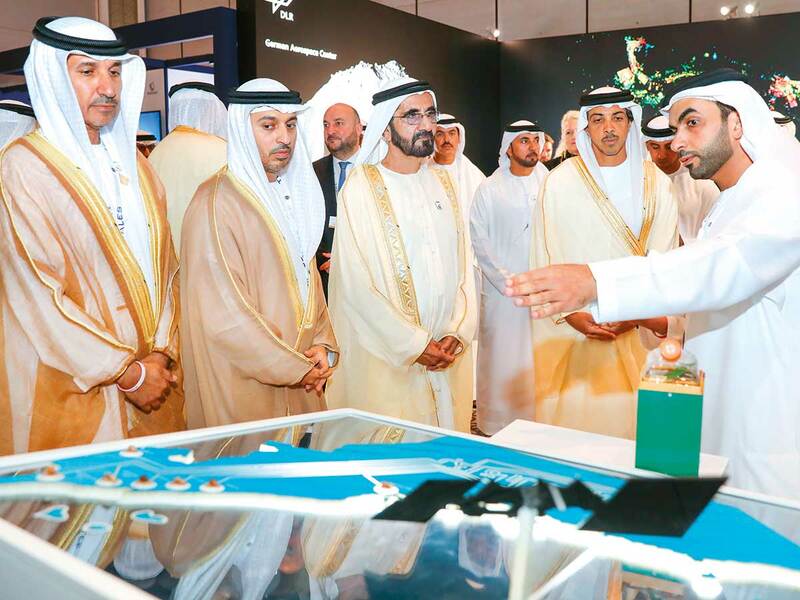 Expressing his pride in the UAE’s leadership in the space sector, Shaikh Mohammad said: “We have launched some months ago the first Emirati-made satellite and we are working to develop the first Arab and Islamic probe to Mars. Our ambition is to bring about Arab achievements in the farthest point of the universe,” Shaikh Mohammad said. A senior official told Gulf News that the satellite will be launched within three years. “But we will start working on it from today,” said Dr Mohammad Nasser Al Ahbabi, director-general of the UAE Space Agency, speaking to Gulf News on the sidelines of the congress. He said the satellite will also benefit health and urban planning sectors, apart from environment and climate. It will help detect and monitor natural resources such as water and minerals across the Arab world, the official added. The Arab Group and Satellites are meant to create opportunities for the future, he said. “We would like to work with our brothers and sisters in Space Centres and Space Agencies in the Arab World, who are writing the script for the future in space. Space is all about cooperation,” he added. Etienne Schneider, Deputy Prime Minister and Minister of Economy, who addressed the congress, highlighted the cooperation between his country. He said the international community has to work together to tackle problems in the space such as space debris. A number of senior Shaikhs, ministers and officials attended the opening ceremony of the congress.